Your correspondent has done his best to confirm the legitimacy of the loop. While there’s (understandably) been no confirmation from Ms. Spears’ camp, it’s included here, as he can find no meaningful refutation… rather, mostly just comments expressing no surprise whatsoever that things are not as they are meant to seem. The “T-Pain effect,” as it’s come to be known, is now so widespread (again, see– and listen– here) that it seems to be taken for granted. Indeed, readers can download a T-Pain iPhone app that will do a similar job for them… all of which must be a frustrating state of affairs for performers like Billy Joe Armstrong and Norah Jones, who actually do their own singing, unaided and beautifully. In any case, it’s a (painful) reminder that too often these days, what glitters isn’t even nearly gold… indeed, too often it’s tin. 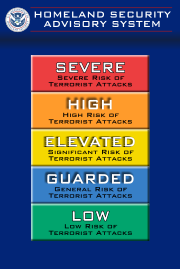 As we reach for the earplugs, we might recall that it was on this date in 2002 (in anticipation of the first anniversary of the attacks on the World Trade Center and the Pentagon) that the TSA “Threat Level” was raised to Orange. It bounced between Orange (high) and Yellow (elevated) from then until mid-August, 2006, when it returned to Orange– where it remains to this day.